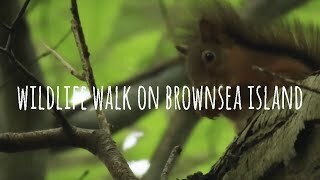 This short loop walk explores the stunning coastal scenery of Brownsea Island in Poole Harbour – famous for its red squirrels and as the birthplace of Scouting. Brownsea Island’s many and varied habitats include pinewood, heath, mixed woodland, shore and lagoon, which support a wide array of wildlife. There are no grey squirrels on Brownsea Island, even though they’re usually better adapted to survive in this type of woodland than red squirrels. There are more than 60 types of tree to be seen including oak, beech, holly and ash. The lakes on Brownsea (which resulted from peat digging) attract many insects, including 24 species of dragonfly such as the small red damselfly and the ruddy darter. There are facilities including a National Trust shop, toilets and café.